this Australian stamp shows Florence Nightingale (1820-1910) in the background behind a contemporary nurse of 1955.
considered one of the finest diagnosticians of his day, he created the first residency program for specialty training of physicians, and he was the first to bring medical students out of the lecture hall for bedside clinical training. Nice to see these three classic stamps. I love the theme. The Australian design would be a favourite. 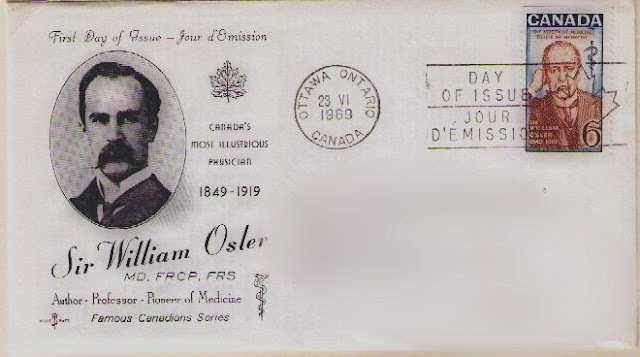 Interesting and nice stamps. And great to see the two languages on the first stamp: as gar as my knowledge of English and French reaches, the texts are slightly different!? you are right - the French would translate as "strength of the nation"
no idea why the phrase couldn't be the same in both languages. 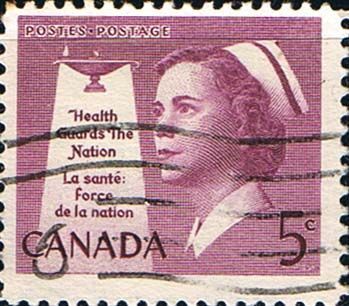 The only other nurse stamp I've seen is from Iceland. 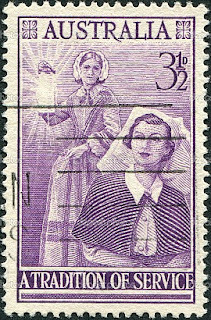 I particularly like the Australian stamp with nurses from different times with one of them being Florence Nightingale. Nurses make the medical profession work and move forward. I love this post. Thank you so much for the back story.